In which I select 15 DCC adventures that I think everyone should have. I am not including anything that I wrote, or did the conversion work for - I leave that to someone else! In addition, I am only including adventures that are available at the time of this writing. Finally, not appearing on this list is in no way a condemnation of any other adventure! Narrowing the list down to fifteen was heart-rending, and some extremely good material didn't make the cut. If I was writing this a month ago, or a month from now, my selections might change, and some of that material might be on the list. This list is only a snapshot of my thinking at this time! Still, kudos to anyone who made it, and apologies to those writers whose adventures were culled from my initial short list of 25. Even reaching that short list required brutal sacrifices of well-loved adventures. Forgive me. I cried too. 15. 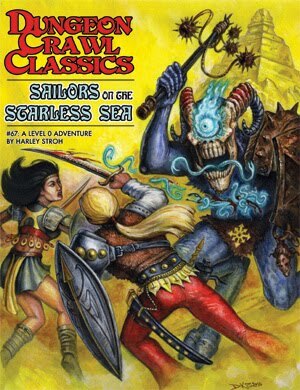 Sailors on the Starless Sea (Harley Stroh, Goodman Games): I am sure that nobody had any doubt that this one would be on the list. What's not to like? It's got a great set-up, with all sorts of hidden goodies that may (or may not) be found, depending upon what the players do. It has a definite "You Will Encounter Things Out of Your League" moment. It has a wonderful climax. 14. Street Kids of Ur-Hadad (Edgar Johnson, Kickassistan Ministry of Tourism): Found in Metal Gods of Ur-Hadad #1, this is not simply an urban funnel adventure - it is a toolkit to create a nearly unlimited number of urban funnel adventures. And there is nothing in that toolkit that demands that you stop using it once your PCs have gained a few levels, either. It is the soul of the city of Ur-Hadad in a handful of pages. Some of the things going on in Kickassistan might seem a little too "metal" (or a little too weird) for some other campaign settings, but there is enough material here to set up your own "Street Kids" adventure in any major metropolitan area. Even if you never use the material as intended, there is a lot of inspiration toward setting up your own urban areas. 13. 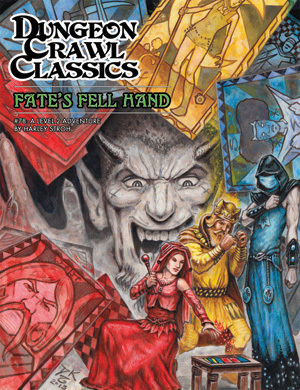 Fate's Fell Hand (Harley Stroh, Goodman Games): Harley Stroh wrote fully 1/3rd of my top 15 picks. Consider what that means, and you will realize that anything with the "Strohdor" name on it is going to be worth picking up. Harley has a knack for setting up intriguing settings where the PCs get involved with various factions, needing to break a balance of power to succeed in their adventure. In Fate's Fell Hand, he does this in spades. It is part of the genius of the Dungeon Crawl Classics RPG that players don't have to wait for the "cool stuff" to happen at high levels; this one is a level 2 adventure. 12. The Ooze Pits of Jonas Gralk (Jon Marr, Purple Sorcerer Games): To my mind, at least at this moment, this is the finest of the Purple Sorcerer funnels. That is not a knock on the others, but a compliment to how well this mixture of social interaction, wilderness trek, and "dungeon" crawl works. Parts of it are quite wacky, but at its heart is a mysterious Lovecraftian horror. The cool thing is that Jon Marr makes both these elements work, and the contrast between them works well. This adventure contains enough meat for several play sessions, introduces the Mist Men, and includes a bear with a fez. Fezzes are cool. 11. The Haunting of Larvik Island (Stephen Newton, Thick Skull Press): This isn't just a dungeon plopped in the middle of a wilderness, this is a wilderness that sets the stage for the climactic dungeon. And the dungeon is cool. There is a giant albatross. There is a puzzle to figure out. There are un-dead, goblins, and ruffians. 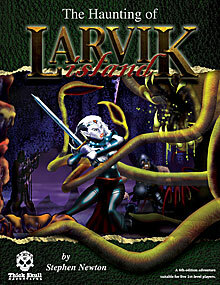 In a way, the adventure is Treasure Island meets Dungeons & Dragons meets Conan the Barbarian. There is something about the set-up, and the pay-off of the adventure that makes me imagine Conan involved in the escapades. Perhaps it is because there are things to talk to, someone to protect, a treasure to be lost or won, and plenty of things to kill. And at least one encounter that would make the burliest barbarian mutter "Crom!" when he faced it. If you have read - or better yet, played! - any of these adventures, you know just how much fun they are. However, I think that there are ten adventures out there which are even better. I'll be getting to them anon. Nothing to thank me for. I call them as I see them. Great... more things to get. Fates Fell Hand and Sailors are both FANTASTIC! If they don't even make the top 10... wow. Which means either the next 10 are even more fantastic, or that you are going to disagree with me. You are welcome to do so if you wish! I own everything for this wonderful game, so I have a lot to sift through! As always, thank you sir!